On September 8th, I had two separate solo exhibitions open at the Saint John Arts centre in Saint John, NB. The City of Saint John Gallery inside the Arts Centre gave me the opportunity to display two bodies of work at the same time and wow, I loved the results! I am not sure if I am able to fully understand the gravity of this amazing opportunity at this moment, I just know that I am thankful. As I described during my brief little speech at the reception, "it really does take a village" to make something like this happen. If I hadn't had the amazing support of so many people it would have been close to impossible. What would we find if we viewed our personalities, minds and souls through a microscope?What does confidence, ambition or courage look like on a cellular level?What is the cellular make up of a soul? Our body and soul, the intangible mind and the physical vessel of our bodies. Together, they make us who we are. If we could visualize both, what would they look like? For six years and counting, I have explored the complex patterns and textures that make up a person. I call this layered pattern work “Lacery”, and it is my attempt to visualize what is going on beneath the surface, to answer the question of what we are made of beyond just flesh and bone. Lacery is about imagining the sum total of a person’s character, physicality, feelings, illnesses, energies, difficulties and ideas. It is my attempt at a visual representation of the internal dialogue which takes place in all of us. 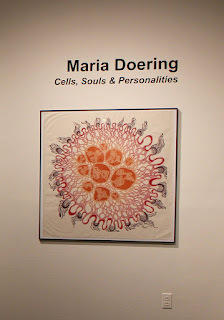 The “Cells, Souls and Personalities” series of linocuts gives these intangibilities a voice, to bring them to the surface and anchor them in the visible world. It is a journey deep into the Lacery of a person, distilling it to a single cellular level. What would the smallest part of this complex Lacery be made of? A single cell. A creative cell. An adventurous cell. An ambitious cell. Possibly a courageous cell. I never thought I would be able to afford to frame all 50 pieces in this exhibition and I assumed it would have to be installed with magnets instead, which is never the best idea with delicate rice paper. 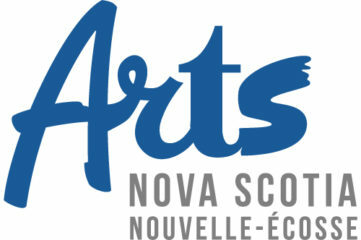 I applied to Arts Nova Scotia for a presentation grant early in the year and to my surprise, for the first time since I have been applying, I received the funding. I can't be happier with the cohesiveness this gave the show and the professionalism it portrays. I am grateful for the support and really am amazed at how lucky artists in Canada are to receive this kind of support. The install of this exhibition at the City of Saint John Gallery inside the Saint John Arts Centre went smoother than I had expected. The amazing Kristina Vermeulen drove up from Halifax and with her help we had it all planned out in about four hours and all hung in about another four. This exhibition at this point included 50 pieces, varying in size from 3x3 inches (framed at 5x5 inches) to 38x38 inches (framed at 40x40 inches). It was the first time that I had exhibited all 50 pieces together and framed. In my opinion: my most cohesive body of work to date. This was Kristina's exceptional handy work. She has the patience with installing work that I do not have. I love how this display of my mini prints turned out! The Adventurous Soul, still one of my favourite prints! The circular framed piece in the centre of this image was finished literally a day before I headed to Saint John. I am so happy with the framing on this one! Thank you Perry at Gaspereau River for figuring out the frame design with me and then building them! 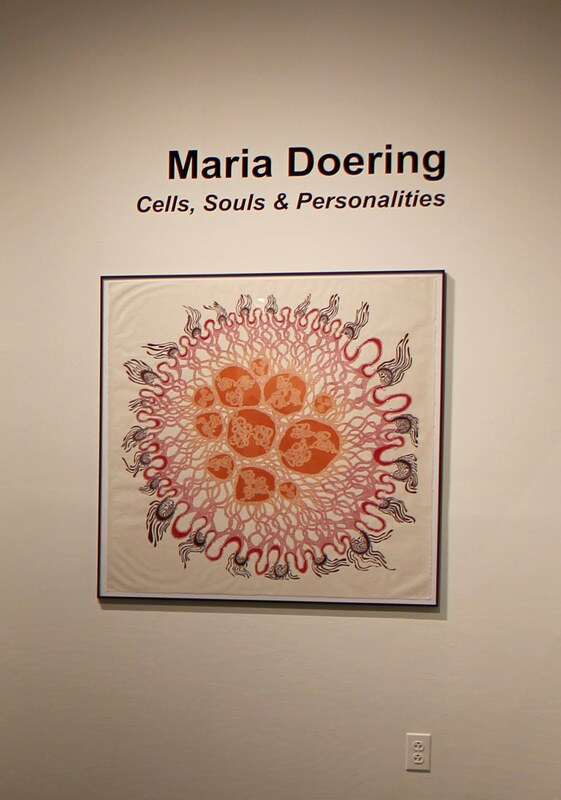 I am already excited to see what Cells, Souls and Personalities will look like when I exhibit it in 2018. There will definitely be 13 new tiny prints and possibly 2 or 3 new large pieces. Stay tuned! “What is a person? Are our bodies filled with a soul? These questions have influenced my art-making for four years. The complex patterns and textures of this work, which I call lacery, is my attempt to visualize what is going on beneath the surface, to try and answer the questions of what we are made of. Lacery is about imagining the sum total of a person’s character, feelings, illnesses, energies, difficulties, and ideas. It is my attempt at a visual representation of the internal dialogue which takes place in all of us. The many smaller paintings are presented as samples of people’s lacery which I have come across over the last several years. Every portrait is of a woman that I have connected with over the years. Each has her own story and personality, and each is a strong, determined and independent woman in her own right. They fight for what they want and believe in, have a strong connection to family, and a multifaceted character. And yet every single person has her own unique set of doubts and challenges. Their portraits are what I see as an outside observer, how every woman presents herself to the world. I have tried to combine this external appearance with a glimpse of the lacery of their being, the patterns swirling beneath the surface, to bring out what the viewer cannot easily glimpse. Internal Dialogues has been shown in several venues over the years. 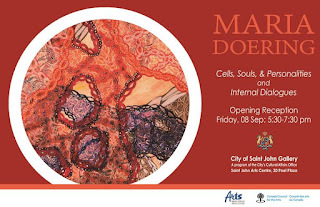 What made this one special was that this exhibition gave the viewer the foundation to the ideas in Cells, Souls and Personalities. It was as if you got to experience my past and my present in the shape of these two exhibitions on display next to each other. I am so grateful to Andrew Kierstead for helping install this exhibition. I didn't think everything would fit into the space and he worked his magic and found solutions. I have to admit that I am also not used to receiving install help from the gallery. In most exhibition situations I am required to take care of it all myself and it was such a treat to be able to just focus on the CSP install while someone else took care of the other show. Thank you so much for that! The City of Saint John splurged on these two gorgeous catalogues! Thank you Bernie for making these happen. They are beautiful and were very popular with gallery visitors. Thank you to my many supporters but first and foremost to Arts Nova Scotia for the framing and to Canada Council who brought me to Saint John for the residency at SJAC.